There are two main systems when it comes to gardening either tilling or not tilling the soil. Tilling is the most common way for soil preparation, this includes working the soil by hand or with a machine, turning under green manures, lime, fertilizers, and other organic matter. 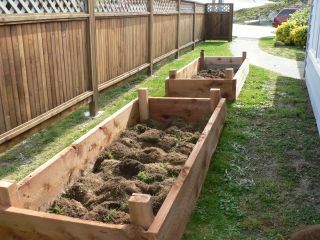 No till, also known, as no dig gardening is another way of managing your garden where the soil is never disturbed. This is a method of gardening where several inches of mulch are spread over the soil and replenished every year. The mulch keeps the weeds under control and decomposes overtime enriching the garden soil. 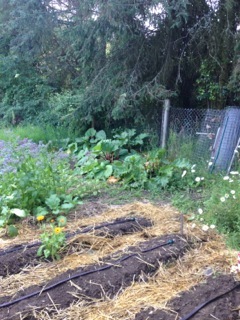 Vegetables are planted through or under the mulch. Benefits of no till: •	Soil structure continues to improve over time. Weeds are pulled or hoed in. Organic matter is put on as mulch to keep weeds down. •	Mow green manures and leave them as mulch •	Earthworms are not disturbed. Use straw as mulch and the earthworms come out in droves. Organic matter is needed to enhance the soil structure and to replenish the top soil which is naturally depleted by growing plants. If your soil is sandy it will enable the soil hold more water; if it is clay it will lighten the soil so the plant roots will grow better. Veggie plants grow best in a fertile light soil and the plant roots need water, air circulation and nutrients to grow well. These basic needs come from your garden soil or from the deep subsoil, so regularly adding in organic matter will enable your plants to get what they need to grow well. Compost – make your own. Animal manures •	Aged manure is more decomposed and less likely to burn the plants. •	Organic standards require aged manure. •	Common types are: Steer, Horse, llama, cow and chicken. Mulching •	Helps with water retention when temperature is hot. •	Keeps soil from hardening. •	Keep soil warmer/cooler. •	Common types are: Grass, leaves, straw, hay, newspaper, black plastic. Most garden soil needs these nutrients added in each season as plants use them up or they are leached out of the soil by wind and rain. Nitrogen – alfalfa meal, alfalfa pellets blood meal, compost, fish emulsion Phosphorus – bone meal, rock phosphate (slow release) Potassium – greensand, kelp meal, sulpomag (sulfate of potash magnesium) or langbeinite. Soil needs trace amounts of 13 or more other elements, which are often naturally found in correct quantities in most soil. Some areas Calcium (egg shells), Sulphur or Magnesium (in some lime) may need to be added. Have fun planting your garden. Do you have questions about certain aspects of your garden, or need some direction on how to get your garden started? Let's have a face to face conversation via Skype? I offer online coaching sessions. Why is Soil so Important is a great new book giving simple and easy instructions on making and keeping your garden soil healthy. Other vegetable gardening books written by Catherine Abbott, Your Vegetable Gardening Helper. Get everyone growing a few of their own veggies. Forward this FREE ezine to a friend.